"You couldn't have made this event any better than it was," Woods said. 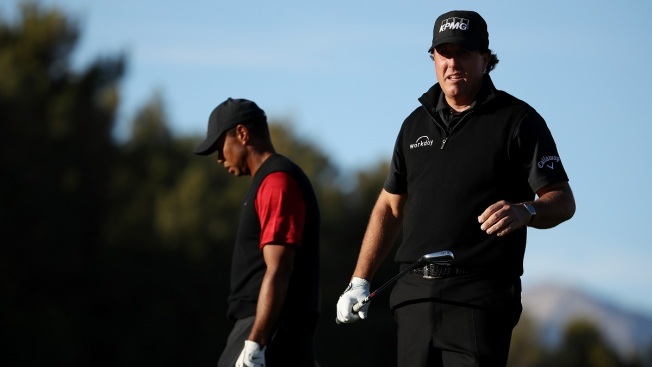 Mickelson said to Woods after the match: "Just know I will never let you live that down. It's not the Masters or the U.S. Open, but it is nice to have a little something on you." "You couldn't have made this event any better than it was," he said. "It was back and forth and very competitive on a golf course that was playing on the tricky side." The match made for some compelling golf at times, if only most people would have been able to see it. Technical difficulties marred the event, which was billed as golf's first pay-per-view broadcast. "We experienced some technical issues on B/R Live that temporarily impacted user access to The Match. We've taken a number of steps to resolve the matter, with our main priority being the delivery of content to those that have purchased the PPV event," Turner spokeswoman Tareia Williams said in an emailed statement. Only 700 invited guests were allowed to watch the event at Shadow Creek. The match was billed as a chance for viewers to watch an untraditional golf broadcast as both golfers and their caddies were mic'd up. It also featured live odds from MGM resorts and a drone was used for live shots. Mickelson said on the 15th hole to Woods that "I'm trying to be more talkative but I'm not on this back nine." Woods understood and responded that they were going back to their old mode of "trying to beat each other's brains in." "I was half a second from giving him that putt because he always makes those," Mickelson said to his brother, Tim, who was his caddie. After he birdied the 17th, Woods said to caddie Joe LaCava "just like old times, buddy." "You've been doing that to me for 20 years, I don't know why I am surprised now," he said. Mickelson also had the advantage in challenge bets. Woods won the first challenge for $200,000 when Mickelson didn't birdie the first hole. Mickelson though won the next three, which were closest-to-the-pin challenges on par-3 holes, which totaled $600,000. Both said they couldn't see challenge bets become a part of regular PGA Tour events. "Maybe at match play you could but that might not be the best thing," Mickelson said. "I think it added to the competition. It had that flavor of a Tuesday practice round with more at stake."